(Bloomberg) -- The loan default in Hong Kong by HNA Group Co. unit CWT International Ltd. is causing tremors in Singapore. Listed real estate investment trusts in the city-state that count CWT as a tenant dropped on concerns there might also be missed rent payments. 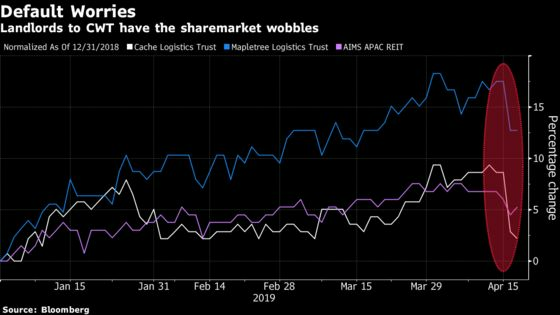 Shares of Cache Logistics Trust extended declines Wednesday to the lowest in more than a month. Mapletree Logistics Trust, meanwhile, is down 4.1 percent since Monday, on track for its biggest weekly decrease since February 2018. CWT’s Singapore business is among the top 10 tenants of both landlords. CWT, which does commodity marketing and provides tourism and logistics services, hasn’t defaulted on its rental payments and there are no arrears due, Mapletree Logistics said in a filing to the stock exchange Tuesday. Cache Logistics said that CWT contributes about 16.5 percent to its gross rental income, down from 20.6 percent as of Dec. 31. Analysts at UBS Group AG, Citigroup Inc. and DBS Group Holdings Ltd. also moved to allay investor concerns, saying any impact should be short-lived. CWT Pte is a separate legal entity to the defaulting party. REITs typically collect six months’ worth of security deposits, which shields them from near-term income disruptions while re-marketing the space. From a risk management perspective however, we observe that most of the affected REITs have been paring down their exposure to CWT in recent years to mitigate “over-exposure” to a single tenant. In the event of a change in control of ownership for CWT Pte, most REITs don’t anticipate any change in the operating side of the business for now, because the warehouses remain fully leased with good demand for space. Citigroup expects CWT International’s potential default to only have a short-term overhang on Mapletree Logistics Trust, noting the firm’s strong profitability and adding that potential asset sales also provide some comfort. In the worst-case scenario, Mapletree could re-lease the properties. Mapletee Logistics currently holds six months of security deposits and has a buffer to activate contingency plans. While management was able to anticipate these risks, the negative read-through to stock sentiment is harder to manage. We expect a stock overhang and weak trading. As Mapletree Logistics is a favorite among investor holdings, we believe some may also use this as a reason to exit.